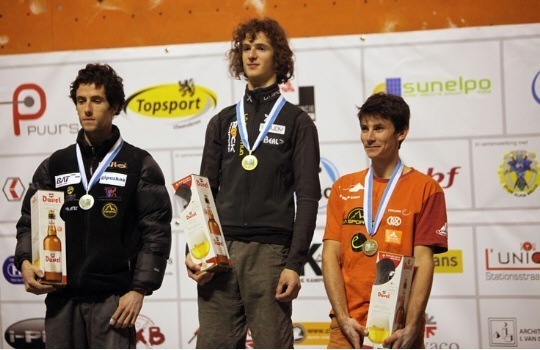 The 4th stage of the 2009 IFSC Lead Climbing World Cup was held last weekend in Puurs, Belgium with two familiar names taking the top spots on the podium. For the Women it was Austria’s Johanna Ernst winning in a superfinal over Ja-Jin Kim of South Korea and Slovenia’s Maja Vidmar. On the Men’s side of the ledger, Czech wunderkind Adam Ondra literally sprinted to victory, topping out the finals route in front of a game Patxi Usobiaga. Apparently that practice is paying off for Ondra. Much better than words about the comp; however, is the glut of media available for those interested in seeing what a world class European lead climbing competition looks like. The Puurs World Cup website has some nice pictures as well as a video archive of the live stream. 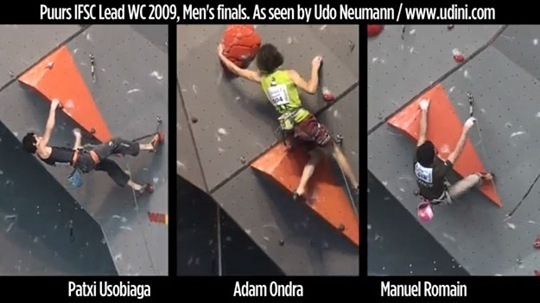 In addition, Udini put together these side by side comparison videos of the top 3 finishers which really give you a sense for how differently Adam Ondra climbs when compared to his competitors. H/T to Joost for the Udini videos. Speaking of Udini, does anyone know where a person might find the somewhat legendary “wizard” video interview with Dave Graham that was once posted on Udini’s site? Thanks to the commenters for their help in finding the video! ← Is Europe Taking America’s Lunch on the Rocks? Yes…and No. theres a video interview with david graham speaking about realization on one of the “lizenz zum klettern” dvds. i can tell you later when im home from work. Yep, I believe that is the one. I like how the winners get Duvel. Now that is a prize! Plus, there are more sponsors than you can even count in the background. Ondra’s chief weapons appear to be fear, supplies, and ruthless efficiency. No screwing around whatsoever. Impressive. That was very impressive to watch. Ondra seemed to climb much more efficiently through the hard moves. While he may lack the strength to shake out all the time he sure made up for with speed. Excellent, thanks for the heads up. but the vimeo video on your link above works just fine, too. He makes them look like they have no idea what they’re doing….they climb 15a…. Did anybody else notice that the women are climbing the same route as the men (as their superfinal) and that Johanna Ernst almost does the route?! 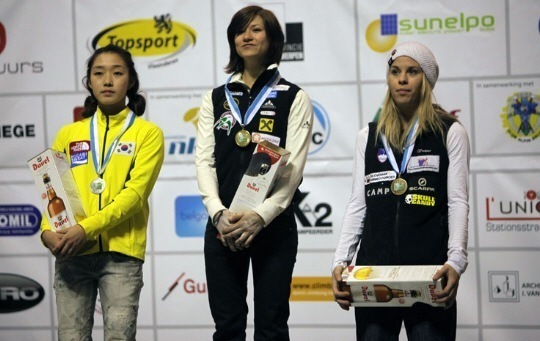 She would have gotten second, behind Adam Ondra, if she was scored in the men’s category. I find that to be extremely impressive.